Did you know that there is an ethical and environmental way to get rid of your unwanted car, whilst raising money for us. Hedgehog Bottom has partnered with Giveacar in a fundraising initiative that will pick up any vehicle, from anywhere in the UK for free. To donate your scrap car to Hedgehog Bottom, simply call Giveacar on 020 7736 4242 and quote Hedgehog Bottom as your chosen charity. 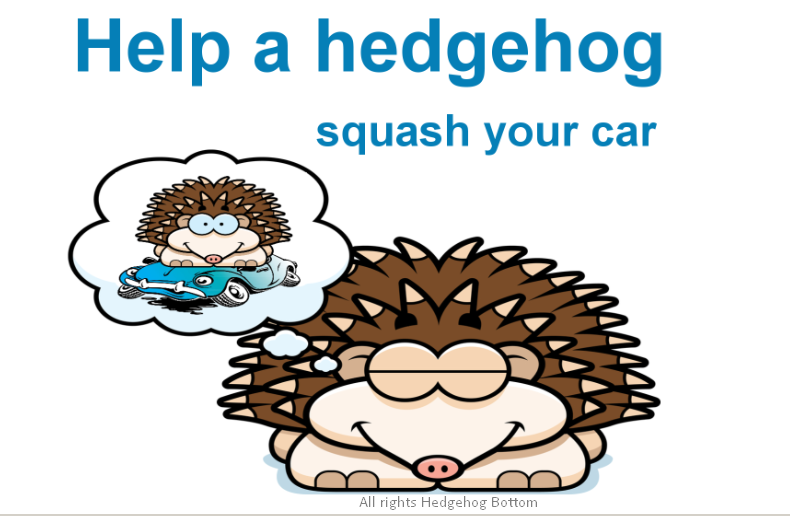 If you have any further questions about Hedgehog Bottom's Giveacar appeal, please call the Giveacar team or see their website at Giveacar Donate to Charity. We do all the work for you, arranging your car's collection, getting the best price, liaising with your chosen charity. Some car buyers make you deliver the car to their depot - we don't. A tow-truck will come to your door. We are not tied to one charity or to one firm. We work with any registered charity and a range of different contractors up and down the country, to make sure we get the best prices. Is your car only good for scrap? We've got a company that specialises in scrap cars. Is your car roadworthy? Then we'll arrange to sell it at auction. Or maybe your car has parts that could be sold for salvage? We have another auction company just for salvage vehicles. Raising money for charity and handling scrap cars is an unusual combination. We are registered with both the Fundraising Standards Board and the Environment Agency. Giveacar is the UK's first charity car donation service. We created the idea, and we have worked hard to introduce this new source of funding to our charity partners. We aim to give you a simple, efficient and friendly way to turn an old banger into a good deed for charity. We have handled thousands of donations, and raised over one million pounds.